I am 4, sitting at a long pine table the colour of petrified tree sap. There are ’s kids everywhere in a dazzling array of technicolour nylon armour, dungarees, vest tops, water paint stained jeans and socks that slip down the ankle to give the impression that the foot is a foot long. It’s the 90’s so, naturally, there is a finely woven wicker placemat in front of me, the remnants of food from past meals clinging to the fibres like some decaying wattle and daub. I am not hungry, I ate 3, maybe 4, chocolate cookies from a worn blue tin emblazoned with “All Butter Danish Cookies” but I am on the Elvis side of greedy. I like my food and I especially like what my aunt has got in her sun burst orange Le Creuset. It’s Pasta Tuna Sweetcorn night in North Hull, just like it is up and down the country for anyone between the ages of 2-102. Tables will be decked with centuries old grissini sticks destined to be lovingly sucked into a saliva pap before being dropped and trodden into the carpet. Yellow tins of grated parmesan husks, swept off the factory floors of Italy and carefully repackaged for the UK consumer will dispense a fine dandruff of insipid beige onto heaped mounds of stodgy conchigle pasta. If that didn’t sound delicious, it’s finished with a flour heavy bescimella, day-glo tinned sweetcorn and anaemic tuna with all the texture (and probably flavour) of anaglypta. This was the insulting pinnacle of Britalian cooking. A dish that, unlike Spaghetti Bolognese, cream saturated carbonara and the Pollo Sopressa (A more Nato friendly version of Chicken Kiev), that seemingly has absolutely no roots in Italy. What’s more, the very concept of putting a viscous mantle of white sauce over something as delicate at tuna flesh is anathema to the legacy of Italian food as far back as the 4th century BC when Archestratus of Syracuse noted; “the very best way for you to deal with this fish; You need fig leaves and oregano (not very much), no cheese, no nonsense” . If ever a more motley collection of ingredients could be described as “nonsense”, I am yet to encounter them. I can’t say I didn’t enjoy it at the time; , that would be as hypocritical as a former heroin addict turned rehab councillor saying that the nights they spent with the New York Dolls seeing into the future at the end of pipe wasn’t fun. It was a comforting dish, it filled you up, it stuck to your ribs and hugged your throat. The negative side was that it set me on an uncomfortable path with any type of fish based pasta (excluding shellfish) pretty much until today. As I got older the impact of seminal Italian chefs like Carluccio, Locatelli, Alastair Little, Nino Sassau and the team at the River Café began to ripple up north. The blankets of sloppy bescimella, long thick ragus and clumsy cream dishes began to give way to lighter, sweet fresh tomato based sauces, olive oils and buttery emulsions that found popularity in the late 90’s early 2000’s. 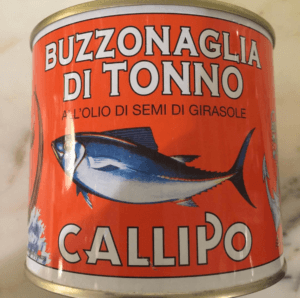 Tuna would be tipped into one of these with maybe a handful of capers, some chopped olives and a little chilli in an ersatz version of a puttanesca minus the anchovies. It would be tossed into linguine with that stylish weed, rocket, and finished with lemon, a crushed clove of garlic, a sprinkle of oregano or finely sliced red onion. All very refined to the eye, but again containing that ever present, seemingly eternal ball of trachea clogging tuna. Here is where the problem lies, Tuna flesh starts life red, like you see in the fancy unaffordable packs in M&S. When they can it, they bleed it first and then cook it. When you cook it a second time, Bang! You’ve got the edible equivalent of wood chip – , basically an inedible pointless protein. Its curious, delicate flavour gets lost, imparting nothing more than a faeint tang of ozone to any pasta dish. It’s only real legacy, following a long mastication is the feeling of it scraping down your gullet and something equivalent to a test match in the time it takes to swallow. I gave up with tuna in pasta, or any type of sea fish for that matter, for a long time. I enjoyed both too much to spoil the other with their unholy union, a union I felt was more toxic than a TOWIE wedding. I mentioned at the beginning of this diatribe against such a seemingly inoffensive dish as pasta with tuna, that I couldn’t bear the thought of it….up until now,. Recently I had some kind of Damascene conversion. I didn’t see a stern faced Jesus appearing on an arid dessert track, instead I saw San. Francesco Di Paola dressed in his habit, emerging out of a rip tide staring a bulbous looking blue fin square on. Emblazoned across the Fender Jaguar orange tin in white copperplate the glorious words “Buzzonaglia Di Tonno, Callipo”. For Italians this may not be a new revelation, but for a man brought up on skip jack in spring water it’s like finding the Garden of Eden was behind your compost bin all along. Funnily enough, on first glances, it bears striking resemblance to the interior of the compost bin. Far from the insipid beige hall-carpet pallor of your everyday tuna, the “Buzz” looks like Operation Dessert Storm camo: a pastiche of meaty white flesh, fatty blacks and browns and the occasional lattice of veins. It’s this inclusion of the dark meat that is the game changer. Italian and especially Sicilian chefs have known for generations that this is the stuff you do match up with pasta. Even Elizabeth David knew it, stating that during her time in Sicily the fishmonger would wrap up the white and dark meat, some fatty ventresca (belly meat) and even the heart of the beast. Like all that is good in this world to eat, the secret ingredient is, lamentably, fat. I’ve used it a few times now. I’ve cooked my pasta, finished it with olive oil, chopped taggiasche olives and some finely sliced tropea onions, before heaping half a can of this terrifying, oleaginous fish flesh on top with just the slightest squeeze of lemon. I even tried it with a San Marzano sauce, cooking the tomato first before adding the tuna after and it was like eating fois gras. The principle is the same for pizzas, do the cooking separately. In this case, a Torpedino base with a short kick of oregano on some good dough, and then use the tuna like some indulgent spread over the top when out of the oven. The possibilities for this can of fishy joy are probably endless, like the Tuna fish itself, nothing goes to waste, not even the can which I have lovingly fashioned into a pen holder. If it were a ship it would pretty much have passed all its sea trials with flying colours and be ready for commission, yet something tells me there is just one more dish it has to conquer before it’s passed fit for service; an old classic, a rule Britalia of a plate beloved by old and young alike…I wonder if Zia Tina still has that Le Creuset dish.